It sounds like the height of absurdity: The Vermont Agency of Transportation started work in July on a four-year project to build two new drawbridges across the channel between Grand Isle and North Hero. But planners say constructing a pair of spans — the first one a temporary structure — is the only way to keep cars and boats moving during a bridge-replacement project on Route 2. This complication, and the expense of the drawbridge mechanisms, will make the $59 million project one of the most expensive in VTrans' history. The state is paying 15 percent of the cost, with federal funds covering the rest. The road is a crucial link for people headed south toward the Vermont mainland. Roughly 3,000 to 4,000 vehicles cross the North Hero-Grand Isle bridge every day. Without it, the best route from North Hero to Burlington would be to drive north to Swanton, then double back south. A 35-minute trip would turn into an hourlong journey. "The detour is significant," said Greg Wilcox, VTrans' resident engineer on the project. "It's definitely on everyone's mind." 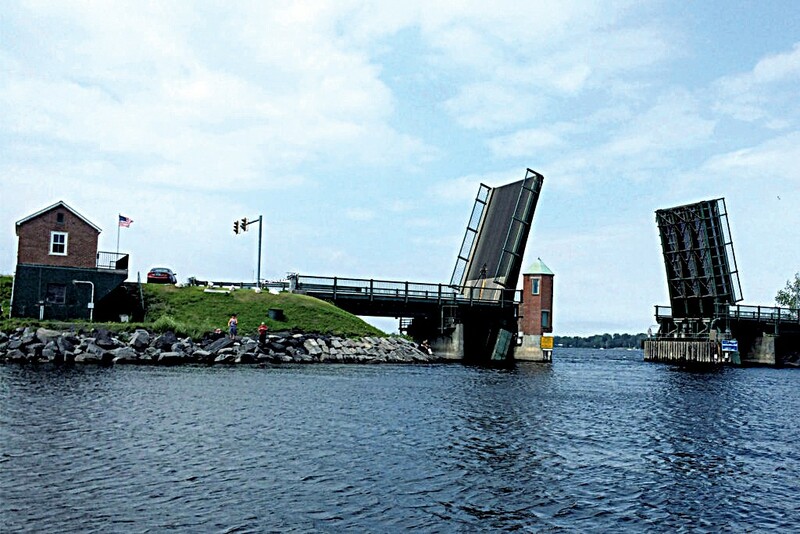 The drawbridge, the only one in Vermont for vehicles, makes it possible for sailboats and large motor vessels to pass through the channel between Grand Isle and North Hero. Boat traffic may seem like a less pressing issue — so what if a sailboat can't pass through for a leisurely day on the lake? But the U.S. Coast Guard, which permits and regulates the bridge, requires the state to be prepared to open and close it on a regular schedule and during emergencies between May 15 and October 15. Otherwise, the state could face fines of as much as $20,000 for each missed hourly opening. VTrans project manager Todd Sumner said Coast Guard officials have been reasonable in the past. When the bridge malfunctioned and stopped working briefly last September, Sumner said, the state repaired it quickly and wasn't fined. "We're just hoping that the [old] bridge keeps opening for the rest of this year," he said. Project planners did not want to alter the footprint of the bridge, Wilcox said, because it would create permitting difficulties. They considered splitting the existing drawbridge in half lengthwise and replacing one lane while keeping the other functional to accommodate boats and cars. Sumner said that plan would have required single-lane traffic during the entire project. Besides the traffic delays, Sumner said, he wasn't completely sure the bridge would have functioned properly in that scenario. When the temporary bridge opens next spring, the old bridge will be raised for the last time and dismantled while in the open position, so that boats can pass freely through the channel. After that, workers will build the new permanent bridge. Once it is ready for traffic, the precisely engineered and methodically built temporary bridge will be demolished. The old bridge, constructed in 1953, is so worn out that the state got special permission from the Coast Guard in 2016 to open it once an hour instead of twice to reduce wear and tear. The state spent $1 million repairing it that year, and Wilcox said it's becoming difficult to find replacement parts. "The technology that that bridge has ... it's ancient," Wilcox said. All of the moving pieces are what make this project, a 259-foot bridge across an 81-foot channel, so expensive. The only one that competes in terms of cost, Sumner said, is the recently completed $60 million bridge that carries Interstate 91 over Route 30 and the West River in Brattleboro. At 1,000 feet, that bridge is nearly four times the length of the Grand Isle-North Hero project. Local business owners said their worries about disruptions caused by the Grand Isle project have eased. When construction began on July 9, workers closed one lane of Route 2 for five weeks while they built foundations on the shore for the temporary bridge. 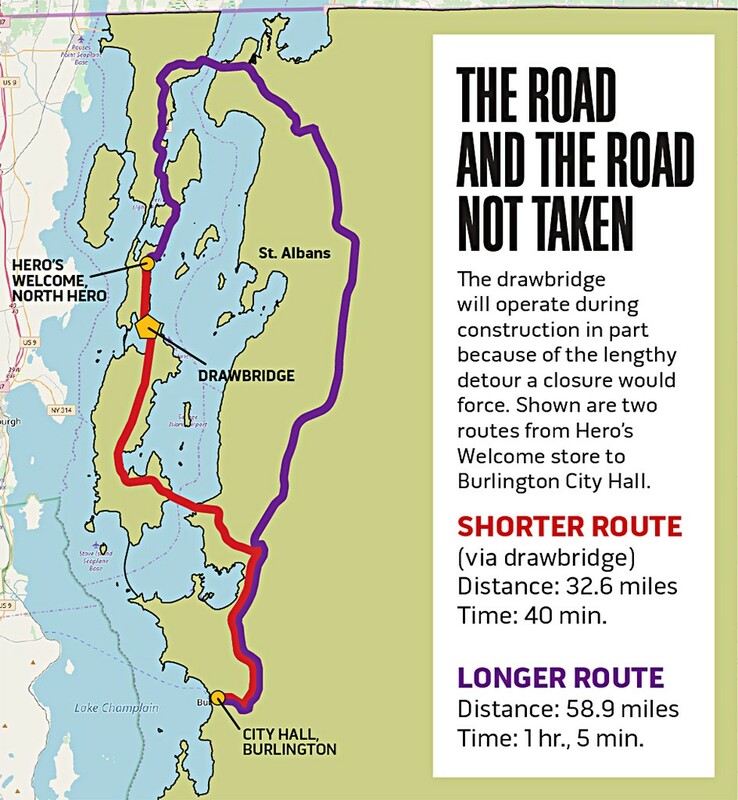 "The prevailing thought and the hype was that ... people were regularly going to have to go all the way around to the north ... to get to Burlington," said Bob Camp, who owns Hero's Welcome, a store in North Hero. "That was very concerning, but it just turned out to be not the case." Camp commutes over the bridge daily and has crossed it 50 to 60 times since the work began. "Maybe once it's been 10 or 15 minutes [waiting to cross], but that's the boats coming through at the top of the hour," he said. "And that's not so far off what normally happens." Emily Clark co-owns Ladd's Landing Marina on Grand Isle, next to the southern end of the bridge. She said the state has been receptive to most of the issues she's raised during construction, though she was frustrated with the project's timing. To her annoyance, the lane closure perfectly overlapped with summer. "We would've much preferred them to do that part of the work after the peak of the season," she said. Last week, VTrans took down the temporary traffic lights that had stopped vehicles during the weeks of single-lane work. Clark said things have since smoothed out, and the disruption "ended up not being as troubling as people feared." Overall, Camp said, the job hasn't hurt business. "We've just gone through the busiest time of the year," he said. "We're now on the back side, so we've seen as bad as it can be. And it's not bad." Wilcox said he understood why local shop owners were concerned, but Coast Guard requirements drove the scheduling. In order to keep the boating channel open until October 15 and then have the temporary bridge ready to go by May 15, construction had to be timed just so. Even with the July start, employees of Cianbro, the Maine-based company that has the bridge contract, will be working overtime to meet the May 15 deadline. The company has a special unit dedicated to movable bridges, and about two dozen workers were on the job site when a reporter visited last week. They were working so fast, Wilcox said, that the shop fabricating parts for the temporary bridge was struggling to keep up. "[Cianbro] gave us a schedule that was six to seven days a week, 10-, 12-hour days," Wilcox said last week as he sat in his air-conditioned, wood-paneled office in a double-wide trailer near the construction site. For the next four years, he'll spend much of his time in the sparsely furnished office, he said, pointing out the photos of his family taped around the window near his desk. He's not bummed out about it, though. This job site is luxurious, he joked: On simpler projects, the office trailers aren't double-wide. Despite the costly implications of a mistake or delay, Wilcox is confident about the project. "We're not surgeons, so we don't need to make split-second decisions," he said. "Nothing is changed on the fly."